Wing Chun has been passed from teacher to student verbally rather than in writing, making it difficult to confirm (or clarify) differing accounts of the martial art's creation. 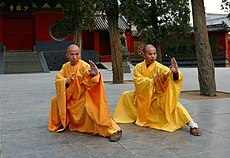 Attempts have been made to apply methods of higher criticism to oral histories of Wing Chun and other Chinese martial arts, and to discern the origins of Wing Chun by determining the purpose of its techniques. Wing Chun began to appear in independent documentation during the lifetime of 19th-century Wing Chun master Leung Jan, facilitating verification of its subsequent history and divergence into branches. After escaping the destruction of the Fujian Shaolin Monastery by Qing forces around 1730, the Abbess Ng Mui fled to the Daliang Mountains on the border between Yunnan and Sichuan. Ng Mui often bought tofu at a shop owned by Yim Yee (嚴二). Yim Yee had a daughter named Yim Wing Chun (嚴詠春), whom a local warlord was trying to force into marriage. Ng Mui taught Yim Wing Chun a version of her southern-Shaolin kung fu, which allowed to drive off the warlord. After completing her training under Ng Mui around 1790, Yim Wing Chun married Leung Bok-Chao (梁博儔) and taught the fighting techniques which Ng Mui had passed on to her. After Yim Wing Chun died around 1840, Leung Bok-Chao passed the new style on to Leung Lan-kwai. Leung Lan-kwai taught six members of the Red Boat Opera Group around 1850, and present-day Wing Chun descends from the six opera-group members: Yik Kam, Hung Gan Biu, Leung Yee Tai, Wong Wah-bo, Dai Fa Min Kam, and Law Man Kung. The oral history of Yiu Kai dates the creation of Wing Chun to the early 19th century and identifies Yim Wing-chun's father as Yim Sei (嚴四), a disciple at the Fujian Shaolin Temple who avoids persecution by fleeing with his daughter to Guangxi. Yim Wing-chun learned the Fujian Shaolin arts from her father and, from their raw material, created a new style after seeing a fight between a snake and a crane. She married Leung Bok-Chao (梁博儔), a Shaolin disciple like Yim Wing-chun's father, and taught him her fighting style. The couple began teaching Wing Chun's fighting style to others after moving to Guangdong Province in 1815, settling in the city of Zhaoqing. According to one theory, opponents of the Qing dynasty used the Red Boat Opera Company as a cover to disguise themselves as a troupe of traveling entertainers. Their identities as Chinese opera performers provided cover for martial-arts training, but the flashy moves of opera-style martial arts were not suited to espionage and assassination. Although assassinations would be carried out with poison or knives, their targets were usually protected by bodyguards. Wing Chun was reportedly designed to deal with an opponent who seized rather than struck, silencing the opponent immediately. This would explain technical aspects of Wing Chun, such as its emphasis on close-range combat and its strikes to the throat and diaphragm. Several other Chinese martial arts originated in Yong-chun and the surrounding area, most notably the Fujianese style of White Crane (one branch of which is called Wing Chun Bak Hok Kuen (永春白鶴拳), Wing Chun White Crane boxing). Li Wenmao (李文茂), an opera performer and leader of the 1854–1856 Red Turban Rebellion in Foshan, is said to have been a Wing Chun White Crane practitioner. Wing Chun may have been created by the five elders of the Shaolin temple whose systems included white eyebrow, white crane, Shaolin, Hung Ga and Choy Li Fut. The technical similarities between Wing Chun and Fujian White Crane suggest that they are related. According to Ip Man's student, Leung Ting: "[The] Wing Tsun System is derived from the Fukien System of kung fu. Their common features are that during fights, pugilists of these systems prefer short steps and close fighting, with their arms placed close to the center, their elbows in and behind the arm and kept close to the flanks to offer it protection. Another characteristic of these two systems of kung fu is, unlike those of Kwangtung Province and Northern China, their boxing forms are rather simple". All Wing Chun descends from six Opera Boat members who were taught by Leung Bok-Chao from 1845 to 1855: Yik Kam, Hung Gan Biu, Leung Yee-Tai, Wong Wa-bo, Dai Fa Min Kam and Law Man Kung. Leung Yee-Tai used a pole to steer the Red Opera Boat away from rocks and shoals, and was chosen by Shaolin master Jee Shim to learn the six-and-a-half point pole. Through Jee Shim, the six-and-a-half point pole was added to the Wing Chun system. Leung Yee-Tai and Wong Wa-bo taught Leung Jan, whose students included his son, Leung Bik (梁壁); "Wooden Man" Wah (木人華) and Chan Wah-shun (陳華順, nicknamed "Moneychanger Wah" 找錢華), from whom the Ip Man, Yiu Kai and Pan Nam lineages descend. "Dai Fa Min" Kam (大花面錦), who played the role of the martial painted face, is the ancestor of the Way Yan lineage. The Yuen Kay Shan and Pan Nam branches descend from Wong Wah-bo and "Dai Fa Min" Kam. Hung Gun Biu (紅巾彪) passed the art to his son-in-law, Yin Lee-Chung, and the Wang (王) family. In the Red Boat Opera Company the virtuous female was played by Yik Kam (翼金), better known as Ching-Deng Kam because of the role he played. Cho Shun (曹順), who played the Little Martial (小武) role, was a student of Yik Kam. By passing the art on to his son, Cho Dak-Sang (曹德生), Cho Shun established the Wing Chun lineage of the Cho family from the village of Panyu. Ip Man, who died in 1972, was the first Wing Chun master to teach the art in Hong Kong for a fee. His students (and theirs) make up most of the present practitioners of Wing Chun. However, Ip Man may have paid Chan Wah Shun (who worked for Ip Man's father) for instruction. Films about Ip Man include Ip Man, Ip Man 2, Ip Man 3, Wong Kar-wai's The Grandmaster and The Legend is Born: Ip Man. & Ip Man:Final Fight. 大東風 dàdōngfēng daai6 dung1 fung1 "Great East Wind"
刨花蓮 pàohuā lián paau4 fa1 lin4 "Wood-Planer Lien"
翼金 yì jīn better known as "Ching-Deng" Kam (? ?金; pinyin: "qingdan" jīn) because he played the role of the virtuous "female"
^ "Choy Gar Kung Fu". Archived from the original on 9 May 2007. Retrieved 22 June 2018. ^ Leung 1978, p. 30. ^ "Yip Man Biography". The Biography.com Website. A&E Television Networks. ^ Elley, Derek (20 January 2009). "Ip Man Review". Variety. Retrieved 22 May 2010. ^ Ebert, Roger (2 March 2011). "Ip Man 2". rogerebert.com. Retrieved 8 May 2011. ^ Tsui, Clarence (17 December 2015). "'Ip Man 3': Film Review". The Hollywood Reporter. Retrieved 18 December 2015. ^ Lee, Maggie (2013-01-08). "The Grandmaster". Variety. Retrieved 2013-01-09. ^ Lee, Maggie (October 14, 2010). "The Legend is Born: Ip Man -- Film Review". The Hollywood Reporter. Retrieved April 27, 2018. Chu, Robert; Ritchie, Rene; Wu, Y. (1998). Complete Wing Chun: The Definitive Guide to Wing Chun's History and Traditions. Boston: Tuttle Publishing. ISBN 0-8048-3141-6. Leung Ting (1978). Wing Tsun Kuen. Hong Kong: Leung's Publications. ISBN 962-7284-01-7. Ritchie, Rene; Chu, Robert; & Santo, Hendrik. "Wing Chun Kuen and the Red Junk Opera". Archived from the original on March 16, 2006. Retrieved August 14, 2005. Ritchie, Rene; Chu, Robert; & Santo, Hendrik. "Wing Chun Kuen and the Secret Societies". Archived from the original on March 16, 2006. Retrieved August 14, 2005. This page was last edited on 5 March 2019, at 18:26 (UTC).